I’ve developed an obsession with two patterns the past week. I’ve actually been obsessed about Jen’s Kat dress when I first found her in burdastyle. But a recent project (to be revealed) reminded me how much i loved that curve she added below the bust. After obsession with them for a few days, I realized they are both color block dress. I know I am pretty late to the color block party but but… I think I will make both this year, especially if i dont get distracted. They are actually perfect – one for work and one for play. But I am almost paralyzed with excitement. There are just SO MANY possible color combinations!! Nice readers, can you suggest some color combo for me before I set about buying all sorts of fabric? For vogue pattern, I need 4 colors, and for the kat dress, I need three. I have some initial ideas: I wanted a navy-red-tan-white combo for the vogue dress, but that combo seems to look so fun on the kat dress and im not sure if it works well in a work setting. For the Kat dress, I am thinking about a purple-tulip-white combo… What do you think? Suggestions please!!! Lastly, do you prewash the fabrics like crazy before a color block project? I am always annoyed that the darker fabric seems to dye the lighter fabric during washes post project, even if I had pre treated my fabric! It seems the worst in silk fabric. I am hoping the issue wont be too bad in cotton and linen! This entry was posted on Tuesday, July 16th, 2013 at 10:17 pm	and posted in Uncategorized. You can follow any responses to this entry through the RSS 2.0 feed. I don’t know personally but I think it would be fun to go matching in fabric shop as you may come across a combo that you would never have put together and think wow that so looks the Biz. 2. A combi of pink and purple somewhere. I always pre-wash (maybe a couple of times) fabrics if the garment is to be washed. I’d bekind of leery of using a white fabric combined with darker fabrics. However, those dye-catcher sheets they sell in the detergent aisle might work at keeping the darker dye in the wash and rinse water from attaching to the white fabric in a color-block dress. oooh, i’ve never heard of dye catcher sheet, i will look out for them next time! thanks! Glad to be of help! The brand I have is called Shout Color-Catcher but there are probably other brands out there, too. Those are fabulous renditions! Hehe… can’t wait to see your versions! There are too many ideas to narrow down what fabric choices to make… such endless possibilities! haha yeah! thus the indecision! Thank you for featuring my dress 🙂 have you decided on a colour combination yet? 😀 I have decided on a purple/floral for the kat dress and started sewing it – its all from my stash. 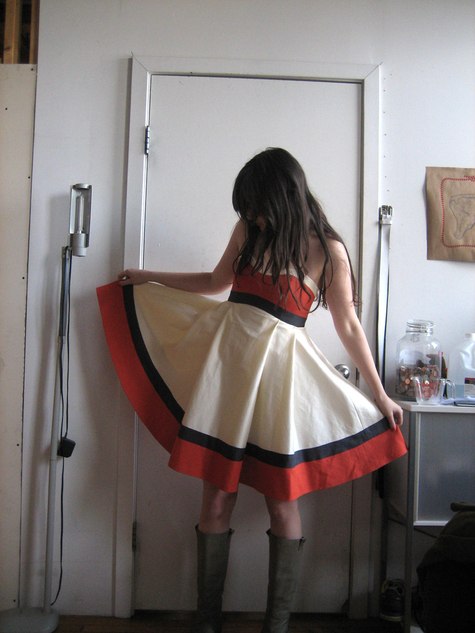 for the vogue dress, i think i will do white-red-beige-navy, or some sort like that. The problem is that I have the navy that I want to use – but I am having a hard time finding the same weight and stretch fabric for the other colors. the hunt is still on! on the other note – i got the vogue pattern for $4 the other day! I want to see more jewel tones on you since I think you look great in them! Maybe emerald as the main color and silver as the accent. But amethyst is pretty too! Nice fall colors.